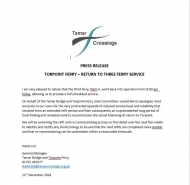 The latest update provided by David List, General Manager of Tamar Bridge & Torpoint Ferry. Come and join in the Annual Christmas Lights Switch On from 2pm on Saturday 1st December. Torpoint's fabulous retailers will be open together with various market stalls. Enjoy a packed programme of entertainers on 2 separate stages and a Nativity Play in Cornerstone Church. Presentation to the winner of the Best Dressed Window Competition with the Grand Switch On at 6pm by local celebrities. There is a whisper that Father Christmas is going to attend. Can you help change Lonely to Loved? The CTT Home Alone Christmas Day Lunch has been providing food and company since 2011 for those who have no-one to spend Christmas Lunch with in Torpoint. To do this we need a Qualified and Competent Chef. Please contact Viv on vivienne.a.morris@gmail.com if you can cook a Roast Lunch with all the trimmings plus a starter for up to 50 people, or you know someone who can. Cornwall Council recycling survey goes live - please help us promote it!